Home\Purple\Mr. Woo – Hylocereus sp. Mr. 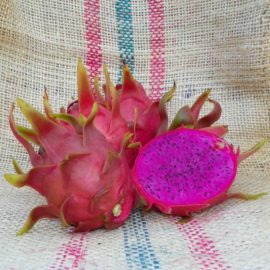 Woo Dragon Fruit variety comes from the genus Hylocereus and an unknown species. 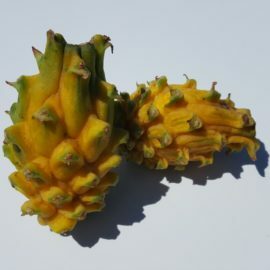 Internet research mentioned the variety was given to a grower and the grower named the variety after the donor, Mr. Woo. Flowers are large that resemble typical Hylocereus flowers. Flower bud to night blooming flower is a typical 30 days then another 30 days to harvest in South Louisiana. 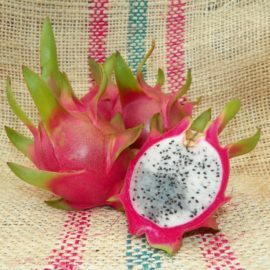 The fruits average size is a pound with a pink/red skin with green fins. One interesting aspect of this variety is the medium-sized thorns. 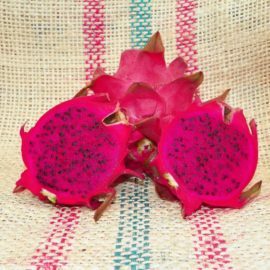 At first look, all aspects of this variety would appear that the fruit would have red flesh, but to our surprise, it’s a firm deep purple flesh. The fruit is a good quality with an average Brix score of 17. After the first taste, we expected a rating between 18 and 19. Our experience with Mr. Woo gave the first fruit with a rating of 16 Brix. It was harvested a little early and I’m sure if it was left on the vine a little longer, the brix would increase. The flesh was very firm, grape-like tangy, and a mild sweetness. We were pleasantly surprised! Spicy Exotics acquired this species of Mr. Woo from a tropical grower in California.